South Mississippi's Source for Model Trains! One of the attractions of model railroading is that it can be enjoyed in many different ways, depending on the age and interests of the user. 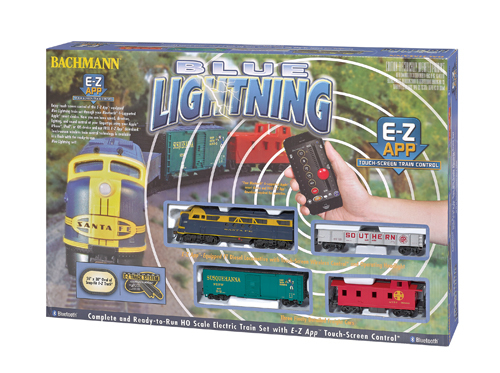 Young children can go "hands-on" with a wooden or battery-powered train, then move up to a basic electric set when they're ready. Many families make a model train part of their holiday decorating, using it to add visual interest to a Christmas village or setting it up around their tree. Serious enthusiasts may have an elaborate layout with hundreds of feet of track, modeling switchyards, coal mines, or commuter rail service. You can even set your trains up outdoors, creating a "garden railroad" that uses your landscaping as a backdrop. What Size Train Should I Buy? Model trains come in a variety of 'scales', a term which refers to the model's size in relation to a real world prototype. HO scale trains are 1/87th as large as the actual railroad equipment they model, so an HO scale replica of a fifty foot long boxcar would measure about seven inches long. An N scale (1:160) model of the same boxcar would be less than four inches long, while an O scale (1:48) version would be over twelve inches long. The term "gauge" is sometimes used interchangeably with "scale", though it actually refers to the distance between the rails, not to the size of the trains that run on them. O-gauge track measures 1-1/4" between the outer rails, for example, while the rails of HO-gauge track are 16.5mm (about 5/8") apart. With so many choices, it's easy to find a train that will work for you! 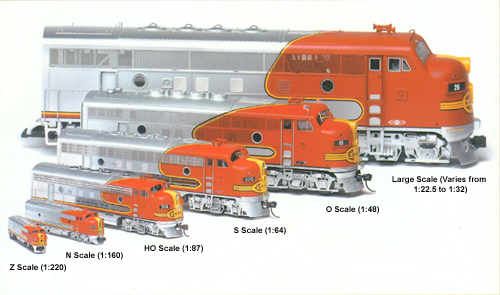 The most commonly modeled scale, HO, has the widest selection of rolling stock (locomotives, boxcars, etc. ); it also tends to be the least expensive scale to work in. A simple circle of HO track can measure less than 36" in diameter, and a fun and interesting HO layout can be built in an area as small as 4' x 8' (about the size of a sheet of plywood). If you live in an apartment, N scale makes it possible to build a complex layout without taking up a lot of space, or if you have small children, you might opt for a large sturdy O scale train set. If you want to set up a train around your Christmas tree, G scale makes for an impressive display. The easiest way to get into model railroading is a starter set, which generally includes a locomotive, two or more additional cars, a power supply, and a circle or oval of track. Purchasing a set guarantees that everything will work together, and the cost is usually less than if you purchased all the components separately. Hub City Hobby has starter trains priced to fit every budget, and when you're ready to expand, we have the track, rolling stock, and scenery you'll need to turn your set into a full-fledged train layout! If your railroad is growing, you'll want to check out our selection of track, rolling stock, scenery, and reference books from major manufacturers such as Athearn, Atlas, Bachmann, Kalmbach, Lionel, Micro Trains, Model Power, Walthers, and Woodland Scenics. We specialize in rolling stock from railroads of regional interest, including Illinois Central, Southern, Meridian & Bigbee, Kansas City Southern, Columbus & Greenville, and many other road names, both current and "fallen flag". We're always happy to take pre-orders for upcoming releases, so if you see something of interest at a train show or in a magazine, let us know! While train sets have been a popular gift for generations, they can also add excitement to your holiday decorating! Christmas trains are available in many popular scales, including N, HO, O, and G. While some sets are available year-round, the best selection is usually found from mid-September to early November, so shopping early is a good idea. Many holiday train sets, especially in the larger scales, have animated or musical cars, enhanced lighting, and other special features that separate them from more ordinary sets. Some manufacturers even offer additional Christmas-themed cars each year so you can grow your holiday layout over time!